It is with great excitement that finally we are going to have a special Run/Walk (2.5km and 5k.m.) 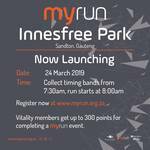 every Sunday from 8am at Innisfree Park. The official launch date is Sunday, 24 March 2019 .Come and enjoy this special place as well as come and experience the “Labyrinth”. 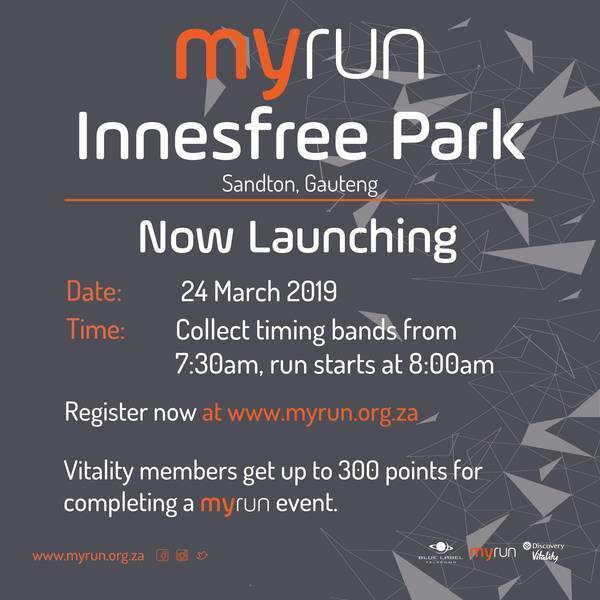 By registering for myrun, you become part of the MyFitness community, where you can join us for weekly runs on a Sunday morning at 8am. You will need to purchase a Timing Band in order to have your run timed and to receive your Results for each Event. The Timing Band will cost you R50.00 incl. VAT. You will collect your timing band at the Venue that you have registered for. Thereafter, you can participate at any Venue you wish. Register now at www.myrun.org.za to obtain a wrist band that will give you entry as well as give you your time.